HomeThe starting point for the journey Who is John Merrifield?My Story My CVYou can read my CV on-line or download a pdf as well as my US degree documents I bought a TadoWhy I bought Tado and how I installed it BMW Off-Road Course 2005 The full colour story of an off-road course that Paul and I took in deepest Wales...we still bear the scars;~) Colorado 2006All the dirt on our first Colorado snowboarding trip....awesome!! During the period whilst we were travelling and I was bikeless I started thinking about bikes and how, as a guy who cut his teeth on a Gold Star, bikes had become heavy, overgrown, unwieldy and all of that. I started thinking of the minimal bike and trawled the web for ideas and in March 2011 stumbled upon Sideburn magazine. Sideburn is a magazine created by a group of enthusiasts of the flat track scene trying to create a presence for Dirt Track/Flat track in the UK. 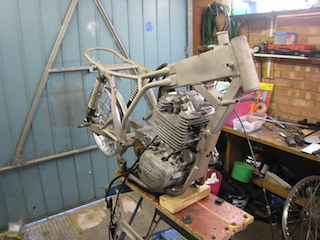 The sort of bikes featured on the pages of Sideburn inspired me to consider building such a machine but I had no idea where to start or what the foundations would be. However the desire had been created and now I had to find a way to fulfil it. 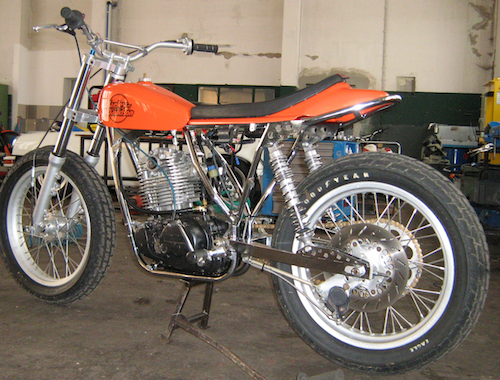 Issue 11 of Sideburn and suddenly I was in love........with the Zaeta........this was the sort of bike that I needed...grass roots, engine, chassis, wheels what else do you need? The problem is we were in Thailand and I could not progress it further at that time. Back in our own home again in West Berkshire I was still dithering about what bike to get, swinging from the Aprilia Tuono to Triumph Scrambler to KTM 690 or 390. Then we went off travelling again for six weeks, with summer approaching it was time to make a decision. Suddenly the Zaeta popped up again on Facebook and I got in touch with Paolo Chiaia to see what was happening. 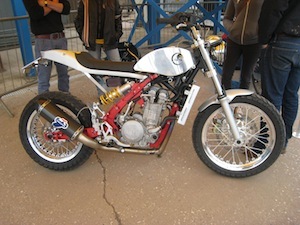 To cut a a long story short, having hardly got over the jet lag from San Francisco I was heading across country with my friend Paul to meet Paolo at DirtQuake 2. I had this idea that maybe I could buy a Zaeta in component form and thus save some of the cost. DirtQuake 2 was awesome and we saw so many amazing bikes and enthusiastic folks, sadly, due to a family engagement, we had to leave before the end but the hunger had returned for a streetable tracker. Sadly, as it emerged, it was not destined to be the Zaeta, I did not have the 10KEuro asking price or even half of it. So back to the drawing board and a pivotal telephone call to Anthony Brown at Co-Built (one of the names I had seen at DirtQuake). Much to my dismay Anthony explained that Co-Built were no longer in the chassis business but only complete bikes but suggested trying to find a Wood chassis from USA. He suggested a couple of influential web sites such as vft.org and flattrack.com to commence my search. 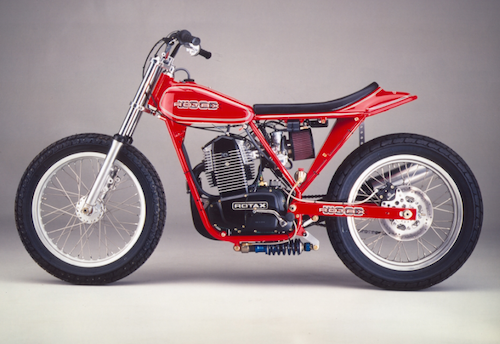 Although I did not know it at the time, this is a Wood Rotax (late with monoshock). Isn't it the most perfect thing you have ever seen? This pic was kindly provided by Elliott much later to try and help me identify a Wood Rotax when I saw one. 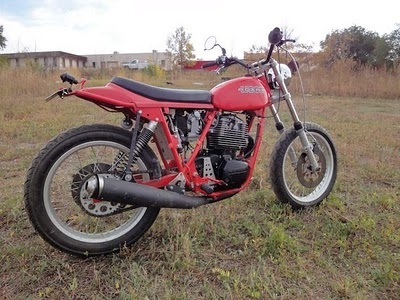 Hardly had I commenced looking on the For Sale and Wanted of vft when this little beauty popped up in Wisconsin, bear in mind here that I knew absolutely nothing about the Wood Rotax, only that it looked the perfect bike for me. Pretty soon I had contacted the owner and also the amazingly helpful 'Elliott' at Ron Wood Racing in California who agreed to provide provenance for the bike if I needed to register it in the UK. The days ticked by slowly while I waited for a number of shipping quotes to come in. Then huge disappointment as each one went well over $2000 and that was without the 26% import and VAT..almost doubling the cost of the bike, another budget buster!! So how was I going to get this bike? Then I had an idea, why not put in 'Wanted' ads in vft, flattrack and shorttrackuk.com for a Wood Rotax chassis and see what response I got? Well I did not have to wait long, over a couple of weeks I had a number of responses from complete bikes, chassis that definitely were not Wood (thanks again to Elliott for checking out the photos for me). Probably the nicest one was this one from Germany. Unfortunately the owner wants rather a lot of money which would stretch the budget to the limit. We are stil trying to find a win win deal on this one. I also got a mail from an Australian who had seen one in Stroud. So the next day I went off down the Rickman emporium and found this. 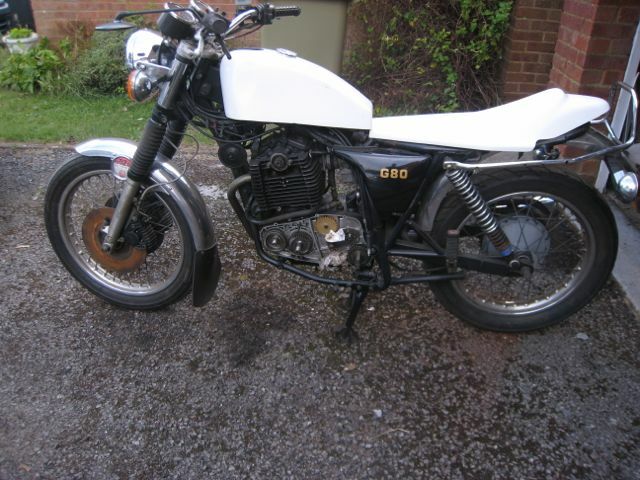 Sadly, not a Wood but a Knight, lovely machine and brand new but not what I was looking for and too much money to boot!! 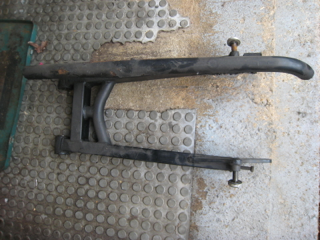 Got an email from a guy in Spain indicating he had a Wood Rotax of which he wanted to sell Frame, wheels and chassis. Sounded perfect, asked Elliott to check it out and sure enough it was genuine and a pretty unique Wood Rotax so we agreed a price. This is the bike. So I parted with money via Paypal, thats when things started going wrong. Next day I got an email from the seller informing me that they could not access the funds so were refunding my money, duly I got an email advising of the refund from Paypal. The seller suggested that to speed things up we could do cash via Moneygram. I agreed to pay half the purchase price and the rest when the stuff arrived. I was given a tracking number for the shipment so all seemed well. Until the next day I had an email from Paypal informing me that the refund had failed............panic set in. I immediately opened up a case in Paypal for non delivery of goods. Then followed ten nerve racking days waiting for Paypal to investigate the transaction. Fortunately for me Paypal came out in my favour. However the scammers (as such they were) got £600 of my money. Be warned NEVER part with cash under any circumstances if you do not know the seller or do not have sight of the goods. Tail between my legs, what do I do now, who can I trust? So back to the drawing board and a call to Steve Hillary at Redmax for a chat. He mentioned that he had a G80 Matchless bike complete that he had been meaning to turn into a street tracker and was I interested? Next day saw me heading down to Alresford where I met Steve and his Dad. 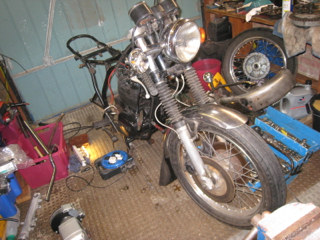 Well a couple of days later the Matchless was in my garage complete with GPRacing SR500 tank and Wood style seat. Only problem is that the bike was not a runner due to the sprag clutch being bust and sadly the previous owner had stripped it down. So along with the bike tank and seat I got a box of bits from Steve. 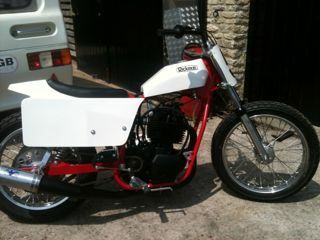 Here is a picture of the bike as it arrived. 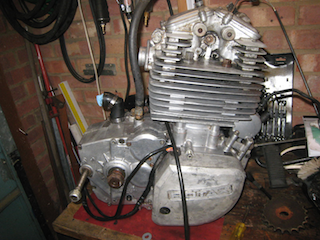 All I had to do now was buy a sprag clutch (a story in itself) and put the engine back together. After installing the sprag, it was then a case of installing the timing belt and pulleys and the starter gear replacing the various covers putting some oil in the engine and spinning it up by jumping it from my Scooby. 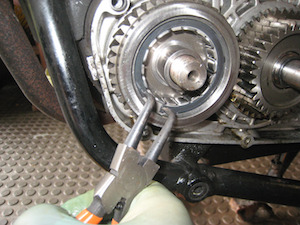 Firstly with no plug to check the belt installation is kosher so no valves hitting the piston. 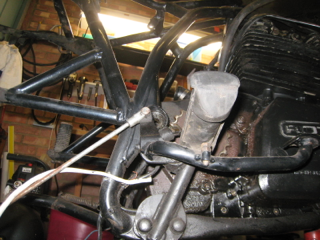 Thank goodness no nasty noises from the sprag or elsewhere so rig up a jury petrol tank, fingers crossed, press the button and bingo the Rotax fires. Hesitantly at first, after a five year layoff, but eventually running reasonably at quarter to half throttle. I could not get it to tick over reliably but that was a minor problem to be sorted later. Next job to disassemble the whole bike down to nuts and bolts, I had a buyer for the complete front end and rear wheel so time to get busy with the spanners. 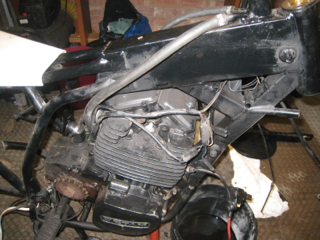 I stripped the bike down to the last nut and bolt, sold off the front end and rear wheel and got the frame shot blasted down to bare metal. 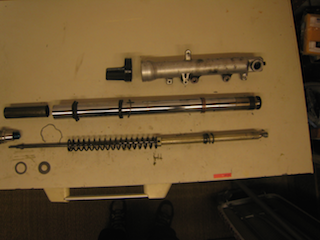 It was originally powder coated, some super strength paint stripper would not touch it, so it was off to the blasters. I then put my paint stripper to good use removing the black paint from the engine. I personally don't like painted engines, I think they should be in good old bare aluminium with a bit of polish!! I bought a pair of R6 forks, stripped them, polished them and then completely rebuilt them with new bushes and seals and fork oil, quite an interesting job. 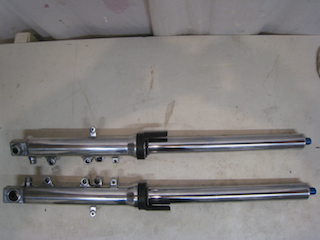 I also started thinking about triple clamps, unfortunately Co-Built were too busy to do them for me so I made contact with Matt at Cool'nComfy who, from their web site, seemed a very capable outfit.